Do you want to improve the privacy of your bedrooms at home? Are you looking to ramp up security through your doors? Are you thinking of putting a new lock but afraid that you're not skilled enough to do the job? Fret not, we know your concerns. With so many knobs, locks, and latches, it can be overwhelming to choose tools to secure the doors. But if you're looking for an easy-install option, the old-fashioned cabin hook remains one of the simplest things you can do yourself. Even if you don't have tools, skills or experience, you can install one in just a few minutes. Simple installation. Easy to use. Security and privacy. Such are the best things about the KUTIR Hook and Eye Latch. Unlike other latching mechanisms, our hook and eye latches are easy to install. One hook is partnered with an open eye screw, and there are included closed eye screws for anchoring the hook. You don't need to drill anything or do some mechanical installations. These hooks can be manually screwed into a wooden surface. KUTIR hook and eye latches work well with different kinds of doors. Like interior barn doors, French doors, or doors with two sliding panels. If you have these sliding door kits N186-964, N186-968, N186-960 purchased from National Hardware, our cabin hooks will be compatible with them as well. These latches also do well with gates, windows, fences, cabinets, closets, cupboards, drawers, sheds. You'll find it useful too for fastening screens and storm panels. These items can stop swinging doors or moving objects, so they won't bang into people. 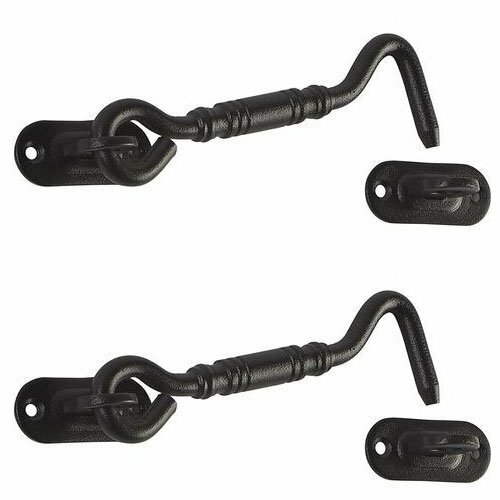 Made of rubbed bronze material, these hooks and eyes are guaranteed tough and ideal for heavy-duty applications. So get that peace of mind at a small cost! ✔ SECURITY & PRIVACY - Create more security and also privacy for all rooms in the house. While the closing and opening mechanisms are done in one step, the security level this KUTIR latch provides is very good. It can work on its own or be combined with your present knobs and locks. ✔ MULTIPURPOSE - The KUTIR cabin hook is an instant fit for barn doors, French doors, dual sliding doors, and sliding door kits N186-964, N186-968, N186-960 from National Hardware. Moreover, it works too with gates, windows, cabinets, cupboards, closets, chests, screens, storm panels. ✔ FASTEN OBJECTS IN STABLE POSITION - While cabin hooks are used to close off any space, it can also be installed to keep swinging doors or moving objects in stationary position. For instance, in the workplace, it can hold open doors so they won't bang with moving workers. ✔ MADE OF BRONZE - With its rubbed bronze construction, the KUTIR hook and eye latches are made for heavy-duty use. This piece of metal is ideal for both indoor and outdoor uses. At 4 inches, it has the length sufficient for many applications. ✔ EASY TO INSTALL - It's easy to screw this hook into a wooden surface. No complicated steps, no experience required, no need to drill anything. Its sharp points bite into the wood easily. For hollow doors, use a metal anchor for #8 screws. If you have any questions about this product by kutir, contact us by completing and submitting the form below. If you are looking for a specif part number, please include it with your message.